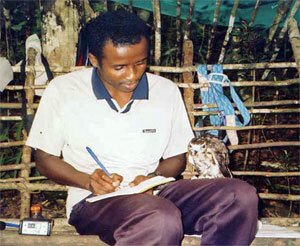 Donatien obtained his BSc degree from the University of Majunga, Madagascar, and followed his studies at the University of Antananarivo for his DEA (Masters equivalent degree) studying the “breeding biology of the endemic Madagascar Cuckoo-Hawk Aviceda madagascariensis at Ambatovaky Special Reserve” in eastern Madagascar. He began working with The Peregrine Fund’s Madagascar Project as biologist in 2008. During 2009 he worked as an assistant biologist at Mandrozo Lake in western Madagascar, a site being created as a protected area by The Peregrine Fund for the Madagascar Fish Eagle Haliaeetus vociferoides. Since 2010, he has been the biologist in charge of the Manambolomaty Lakes Complex, another site being created as a protected area in western Madagascar. This site is also important for the endangered Madagascar Fish Eagle and wetland and forest biodiversity, and as a local sustainable natural resource use area being managed by the local communities.